Here you can see the visitor statistic and the last changes of this homepage. 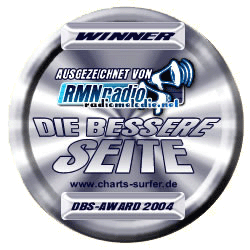 06.03.2004 Winner of the first DBS Award of RadioMelodie.net of the program 'Die bessere Seite' with more than 21% of the delivered votes. 26.08.2002 Because of disproportion of the USA-Charts (database with some year end charts) I changed the hole database. Now from 1940 to 1993 the No.1-Hits and from 32/2001 the Top50 added. Before Look at the german history description !! !